It has emerged that over half of the UK population Skype their pet whilst away on their holidays. As the availability of Wi-Fi in foreign resorts grows, this trend is continuing to see an upward trend. Many people also choose to Skype their pet whilst at work. You could be driven by intrigue, concern or guilt, but either way it is an easy task to set Skype up for your pet. In this article we look at people’s motivations between Skyping their pets, the growing use of digital communications and an easy three-step process which shows you how to set Skype up so that you can join the bandwagon of pet Skypers. It seems that the availability of Wi-Fi has a big bearing on travellers. Business people are the demographic most affected, which is hardly surprising considering the need to constantly be able to access emails and access work interfaces. Therefore, when polled 73% of business travellers said that the availability of free Wi-Fi would have the biggest impact on their happiness whilst away travelling. For one in ten travellers a lack of online communication is a game breaker, as they told the surveyors that they would refuse to travel alone if they had no way to reach their loved ones electronically. The internet as a communications tool continues to grow. Nearly half of those surveyed in the UK said that they prefered electronic communications as their main means to connect with family and friends (43%). According to Jenni Trent Hughes, a preeminent relationship expert, the inability to connect with loved ones whilst away is a course of huge anxiety for many travellers. 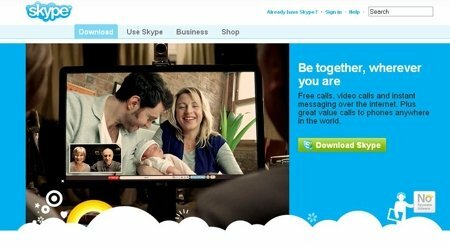 People are increasingly seeking communication methods that allow them to actually see their loved ones as well as hearing them, which is where Skype is coming into its own. It now seems that the ability to connect with loved ones extends to your pets, with a significant percentage of travellers choosing to connect with their pets whilst away. Would you Skype your pet? It seems that people are increasingly Skyping their pets whilst away at work too. At the time of writing, a Gizmondo poll was running asking people if they were willing to sacrifice their dignity in order to talk to their pet via Skype. Over 75% voted in favour of doing so. If you are ready to bite the bullet, it is a very straight forward process to Skype your pet. On your pets account, you will need to enter the settings and turn on the function that automatically answers when somebody calls. This essentially means that calling your pet will activate your computers web cam and will allow you to call over your pet. Next articleiPhone fatally electric shocks woman: Is it dangerous to use your phone whilst charging?